When I wrote about Sweet Bay here, I mentioned that it is one of three so-called bay species native to southeastern coastal plains. Redbay (Persea borbonia) is another of those bay species. 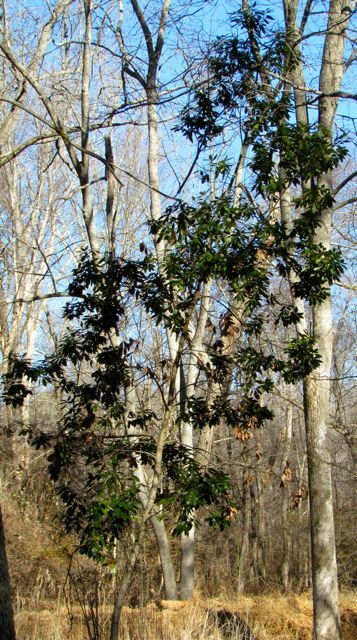 Like Sweet Bay, Redbay’s leaves are evergreen and it is a usually a smaller tree (20-30 feet), although it can grow taller. Also like Sweet Bay, the leaves of this member of the laurel family are pleasantly fragrant — actually more than those of Sweet Bay. 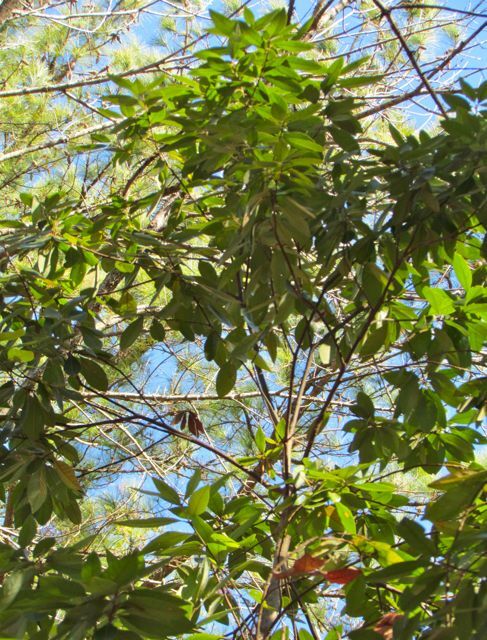 It was consequently used as a bay leaf herb substitute by European settlers of the region. Unlike Sweet Bay, the flowers of Redbay are relatively inconspicuous. Its fruits are purple berry-like drupes that many native birds find tasty. The birds, of course, eat many kinds of berries, but there’s a lovely butterfly whose larvae rely nearly exclusively on this tree: the Palamedes Swallowtail. Its caterpillars may also dine a bit on sassafras (Sassafras albidum), another member of the laurel family, but this small tree is much less abundant on the coastal plain than Redbay. The Palamedes Swallowtail is occasionally seen further inland, but Redbays are vastly more common on the coastal plain, so that’s where it tends to stay. Another butterfly — Spicebush Swallowtail — is more widespread. Its caterpillars also dine on members of the laurel family, mostly spicebush (Lindera benzoin) and sassafras. These two laurel-family-dependent butterflies are some of our larger, more dramatic summer garden visitors, and I fear their days may be numbered, because their larval food source is imperiled. An alien insect is marching up the southeastern coast of the United States, leaving dead stands of Redbay in its wake: the Redbay Ambrosia Beetle. This alien insect carries a deadly fungus that kills infected Redbays usually within a month of infection. The fungus invades the trees when female Redbay Ambrosia Beetles bore into stems to lay their eggs. As they chew, their infected mouth parts introduce the fungus. One month later, the tree dies. One month! Last week, the NC Forest Service released a news bulletin warning that this beetle has now reached the southeastern-most counties of North Carolina. Scientists have not found any weapons against this invader. They expect the beetle to continue its northward march until it runs out of Redbays. After that, they can only guess what may happen. One possible scenario is that the beetle may move to other laurel family species — sassafras and spicebush. This might well spell doom for the Spicebush Swallowtail if its larval food source is killed by the invading beetle and its fungus. And, more important to Florida orchard growers, they fear it may jump to another member of the Persea genus — avocado. The USDA Forest Service has a big section on their Web site that describes all the issues relating to this invading insect and its killer fungus hitchhiker. Read all about it here. One strategy suggested to preserve mature Redbays is to plant them outside their native range. The southeastern Piedmont has proven to be an excellent home for this species. In his Manual of Woody Landscape Plants, Michael Dirr notes that this native of coastal swamps is actually quite adaptable to drier upland soils, and in his opinion, the trees often look healthier than wild ones growing on the coastal plain. My tree is about 25 feet tall, and it leans a bit, never having fully straightened after an intense, prolonged ice storm — but that can happen to any evergreen species. Mine has remained reliably evergreen even during cold winters, and our severe droughts have not hurt it. It provides a nice bit of green in my winter landscape, as well as shelter and food for birds. After reading about the impending obliteration of coastal Redbays, I’ve decided to plant two more trees near the one I’ve already got. I am hoping that perhaps by growing three, they might have a better chance of perpetuating themselves in the landscape over the long haul. And I’m hoping that their isolation in the middle of a Piedmont forest with no other Redbays around will prevent the Redbay Ambrosia Beetle from finding them. Perhaps if more Piedmont gardeners added this lovely, durable evergreen to their home landscapes, Redbays would have a better chance of surviving this invader and its killer fungus. I’ve decided it’s worth a try. Perhaps you might consider joining me? You won’t find Redbays for sale in your average nursery. I’ve ordered mine from my favorite mail-order supplier of native species. This entry was posted on February 27, 2012, 7:40 pm and is filed under Favorite Plants, Native Wildlife, piedmont gardening. You can follow any responses to this entry through RSS 2.0. You can leave a response, or trackback from your own site.